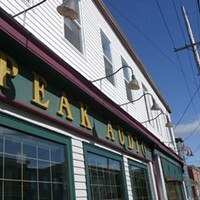 After last year’s silver standing, this year Peak Audio has climbed back to the top spot for its fifth gold win. Serving Halifax for the last 28 years, the family-owned alternative to big-box stores has earned a solid reputation by combining top-notch service and knowledge with some of the highest grade hi-fi, home theatre equipment in the city. And you might not have known it, but Peak carries home furnishings and lighting too—sounds like an excuse to plot that home studio you’ve been dreaming of.